Sea, Sand & Sky: Fun at Carson Beach! Warm sunny day, tons of kids, over a dozen activities and hundreds of hot dogs, its the Beach Bash and Splash! 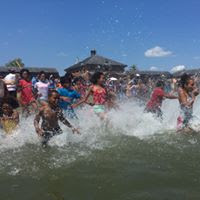 Every year the Beach Bash and Splash is one of the most fun events throughout the summer, and this year wasn't any different. For most of the day I was fishing with kids from many different camps, some of the camps were from Braintree, while others were from South Boston and other nearby areas. Fishing was one of the most popular activities of the day and we always had a large group of kids eager to fish with us. We set up shop about ankle deep in the water, and began fishing. We didn't catch any fish but we did catch crab after crab, and ended up catching over a dozen by the end of the day. After fishing came the main event, where we all lined up and ran into the cold water. First we sang "Haulaway Joe" and took some photos, and after this we were ready for the splash. The Save The Harbor Staff and the campers sprinted towards the water. Some people like Max dove into the water, while others like me just went knee deep, and some people even got thrown into the water. No matter how far into the water people went, everyone had fun. After drying off, everyone went to go get some hot dogs, which were delicious. After eating and relaxing for a little, we all went back to our activities, and for us at fishing, we caught some more crabs!